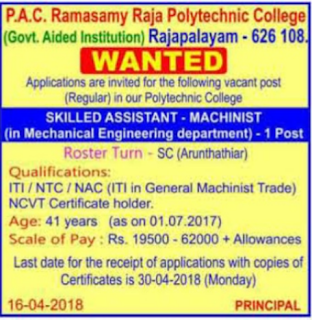 P.A.C Ramasamy Raja Polytechnic College, Rajapalayam has advertised in THE DINAMALAR newspaper for recruitment of Skilled Assistant jobs vacancies. Interested and eligible job aspirants are requested to apply on or before 30th April 2018. Check out further more details below. Name of the College : P.A.C Ramasamy Raja Polytechnic College, Rajapalayam. About College:P.A.C. Ramasamy Raja Polytechnic College, Rajapalayam established in the year 1963 is one of the best polytechnic colleges in India. Created as a Centre of Excellence for higher training and skill development in Engineering and Technology at Technical level, this institution is functioning under autonomous status. How to Apply: Last date for the receipt of applications with copies of certificates is 30-04-2018. Last Date: A early as possible 30th April 2018(Monday).